Companions can be hired in a variety of settings to provide medical and non-medical functions. In the home, be that a private residence or other setting such as an Assisted Living Facility, companions may provide only chores within a household, such as basic meal preparation, cleaning and the like. In some cases, they may assist with nothing more than supervision or simply be there for social interaction without providing any hands-on care. In a nursing home or assisted living facility, a companion or sitter is often hired by the resident or family to provide personal care to the patient at a level that cannot be provided by the facility's nursing staff, in which each member is responsible for a much larger number of patients. These private duty nurses and aides may provide more immediate and detailed service, whereas facility staff can only reach the patient in turn and provide less frequent, rudimentary care. 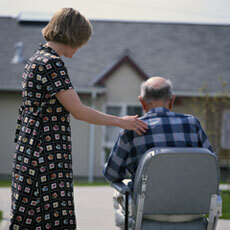 Companions in nursing homes also provide social companionship.